It's time to announce the winner of the LASPACENY $50 giveaway !. The winner, selected randomly with Rafflecopter, is Angie Adelman, I checked and she completed all the compulsory tasks and also almost of all the other tasks ! 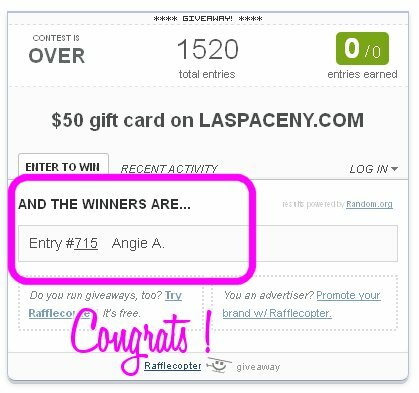 Congratulations lucky Angie, I will give your contacts to LASPACENY and they will contact you directly to give you the $ 50 voucher. Happy shopping ! I wanna thank LASPACENY.COM for sponsoring this lovely giveaway and all of you for taking part in this giveaway, don't worry just because you weren't lucky this time, because new surprises are coming very soon so stay tuned ;-).